Checked my e-mail today and my visa application (and I'm assuming Tim's too, since they were sent in the same courier envelope) has arrived in Ottawa and is being processed. I really hope they go through quickly and without any hitches. Yesterday was a great day. Not only did I get lots of work done on my novel and paper, but I also got to watch the new episode of BBC2's The Hour (which I'm liking, but not loving as much as I hoped I would), read more of The Girl Who Circumnavigated Fairyland in a Ship of Her Own Making (they're trying to catch wild velocipedes! 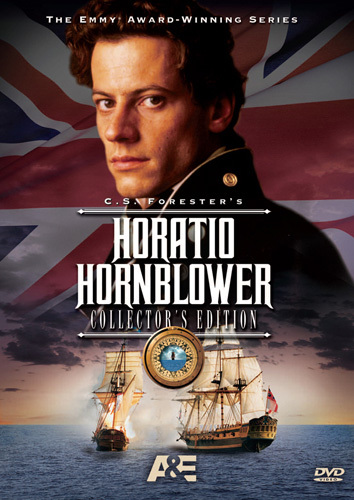 ), and watched the first part of the fifth Hornblower episode/TV movie. Oh, Hornblower. This series was one of the first things Tim and I watched after we moved into our beloved basement suite. We watched the whole thing through last summer too, and had to watch it once again this summer, before we move away. We are both bitter that more episodes weren't made (they had to stop after 8 because they were too expensive to make. However, the money was well spent. The first episodes were from the late 90's and have incredibly high production values for that period.) Perhaps Ioan Gruffud will get his wish and will some day be able to make more. I hope so. I do hope so. Today was another good writing day. I went through most of Chapter Thirteen (in which a Very Bad Thing Happens - fittingly), which didn't need much work at all. It was really rather exciting to read over, since I don't think I'd looked at it for several months, at the very least. What I'm discovering, now working on this poor novel in a sustained way (which I haven't managed for months and haven't done consistently in years) is that all my previous writing (creative and academic) and reading are really coming to bear in ways I hadn't expected. Revising my thesis has given me great tools to use in revising my novel. And the time away, though born out of laziness, probably hasn't hurt either. I find it so much easier to stop unnecessary description or telling ("I felt so happy." Axe! ), or to find places where specific imagery or description is needed. I know when the prose or dialogue feels a little dead and am okay leaving it for the time being. I am confident now that I'll spot it when I go over that particular section again and will be able to replace it or hew it out. All this makes me look forward to whatever novel comes next. This one, though being revised by a 25-year-old Erin, was born out of 20-year-old Erin's brain. In five years, I've done a heck of a lot of reading and writing and travelling and living and I can't wait to see what creative work will be born out of that. But, for now, I'm happy to be working on really whipping this novel into shape and doing right by it. And at the end of the tunnel, which now seems much nearer, I'm totally going to attempt publication.